The game offers the player a classic 5 reel setup and Microgaming has gone for 40 paylines for this game so there are plenty of ways to pick up some winning combos. The famous feral child first appeared in 1912 and he was created by Edgar Rice Burroughs who told the story of Tarzan’s adventures through the jungle with his ape companions. Microgaming has developed a slot machine in its honour and while we have played plenty of jungle-themed slots, this game looks brilliant with some fantastic 3D graphics and wild bonuses to enjoy. The game offers the player the chance to play for free for a limited time and then you can begin to spin the reels from just 40p. The maximum bet is £40 which isn’t the highest so the game may not suit the high roller players as much as other games. However, you can still win big if you are lucky enough to uncover the base game jackpot. As you might expect, this slot offers a jungle theme with plenty of interesting symbols and icons to look out for. 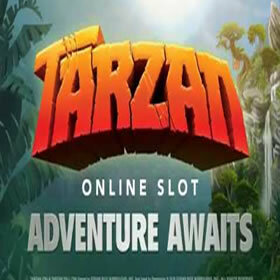 Tarzan is displayed on the left-hand side of the screen and he animates as you play the game. The background of the game is the jungle with plenty of trees vines and exotic looking plants and on the reels, there are objects including oranges, watermelons and apples. The Tarzan logo is the wild symbol and it replaces all other symbols except for the circular bonus symbol. While the wild symbol helps top up your balance from time to time, the bonus symbol is the key to triggering the bonus wheel which is the main bonus feature. It has three main rewards which each offer a variety of bonuses for the player. The Bonus Wheel will spin once it is triggered and players can receive a cash prize, free spins or even trigger the Pick-A-Potamus which is great. There will be 12 hippos displayed and players can select them to receive random multipliers. The feature cannot re-triggered and the player will return to the base game after it is finished. 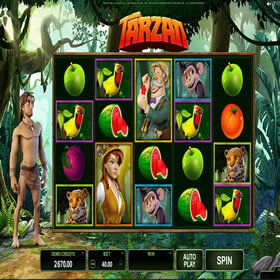 Tarzan is a simple but engaging slot to play with a fantastic Bonus Wheel round to enjoy. The gameplay is pretty solid and the graphics are fantastic. The game will run perfectly on most devices and players can play for free or for real money. Starting out with smaller bets is advised so that you can get used to the game. We found that wild combinations were formed pretty often and the bonus round helped us top up our balance a lot of the time. 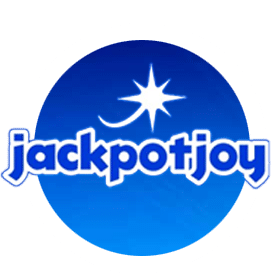 Overall, it’s a modern and interesting slot to spin and Microgaming has done an excellent job with it so head over to Fruity Casa to get spinning today! 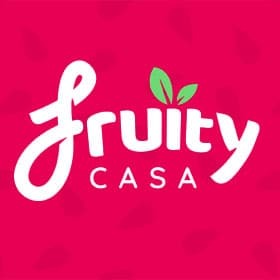 Fruity Casa – Joining is easy and only takes two minutes.